Being Human: "Don't Fear the Scott"
What Worked: For the first time in a long time, I actually liked Aidan's story. While I still don't care about Boston vampire hierarchies, or what Mother's going to do to him and Suren, I did like seeing them run away together, and their double date with Josh and Julia was a lot of fun. Aidan saying goodbye to his friends was another solid moment. What Didn't Work: I find myself disinterested when I think about Josh's love life. I was really on board with him and Nora, but she's doing more interesting things without him (she was far better with Sally than with him this time around), and I'm really not feeling his relationship with Julia. We all know how it's going to end up, which actually works against it because it's starting to seem like the show's stalling. What Worked: The plot about Derrick going behind Tom and Julia's back could have worked with some better dialogue because it was another glimpse at the creative process, but of course it turned into a mess involving the personal lives of people that I don't care about. Dev's friend at the New York Times was also very pretty and displayed more personality than Karen has over eight episodes. What Didn't Work: Where to begin: Ellis, Michael and Julia, Eileen's daughter, everything involving Julia and her family, Brooklyn Bowl, Ellis, Dev's political career, "Touch Me," Karen saying she's sorry, Julia's stupid sunglasses. Pretty much everything that happened throughout the entire episode, but at least I had a good time mocking this episode. What Worked: While the idea of someone bombing an Occupy Wall Street demonstration was a bit heavy-handed, I did appreciate the narrative and visual styles that were used during this episode. They turned what could have been a by-the-books case and turned it into something more. 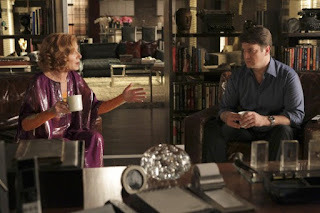 What Didn't Work: I thought that the opening shoots were too bleak, and I'm not a huge fan of the more serious episodes of Castle (at least not the ones where a main character's not in danger). For some reason, having Alexis working with Lanie hasn't gelled for me, but by far the worst offender was the Caskett tease. Honestly, I think I've reached my limit and don't care if they ever get together. 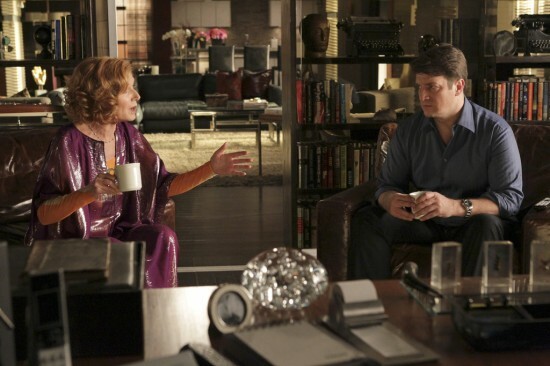 I'm tired of being strung along by Andrew Marlowe, and the wheel-spinning has become maddening. New Girl: "Fancyman Pt. 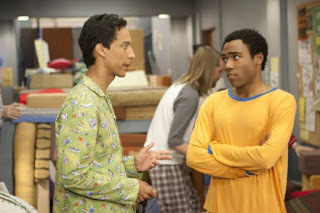 2"
What Worked: This was another solid episode for Nick, and watching him and Martin Starr trolling for college girls was brilliant. I'm always a fan of CeCe and Schmidt, so I was glad to see their relationship progress. Ditto for Winston and his lady friend. Pretty good stuff from the supporting players. What Didn't Work: I wasn't as much of a fan of the Jess/Russell plot. It's not that it wasn't good, but it all had a very familiar feel to it. I'm also still not feeling Mulroney's character, but I did appreciate the fact that he has some confidence issues because it makes him seem more fleshed out instead of just a hottie with a body. What Worked: I absolutely loved the moments between Raylan and Art because they fleshed out their relationship. 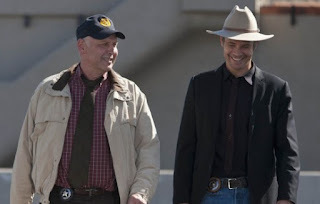 It was nice seeing how Art doesn't see Raylan just as one of his deputies but as someone he cares about and wants to see be safe. The episode may have played the surrogate father card a little too strongly, but it was still amazing to watch. What Didn't Work: I still cannot get on board with some of these characters. Quarles, Dickie and Limehouse are still way too over-the-top to be taken seriously, I find myself being taken out of the episode when I'm forced to watch them. I don't necessarily mind what they're doing; it's how they're doing it that's not working in my opinion. 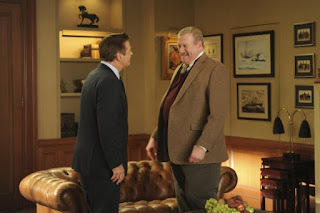 Happy Endings: "Big White Lies"
What Worked: I pretty much enjoyed most of the episode. Penny's web of lies that entangled everyone shouldn't have worked as well as it did, but the cast really sold it. All of the Three's Company riffs and shout-outs were a little too sitcomy, which was the point, but I can watch Alex and Max play around for hours. What Didn't Work: My only gripe was Jane, not because she wasn't funny, but it didn't seem like she was in character. For someone who goes to great lengths to lie to her husband, her telling Penny to be honest with Daphne rang false. Ditto for her need to be liked by Daphne when it's been established that she'd rather be feared than liked. I know I'm nit-picking, and I usually don't care all that much about consistency, but for some reason these moments bugged me. Community: "Digital Exploration of Interior Design"
What Worked: Plenty to like here. 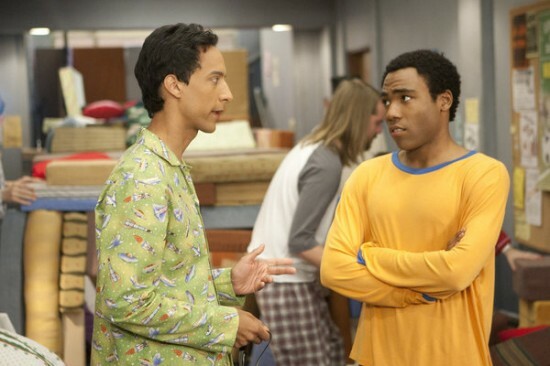 By far the best moments belonged to Troy and Abed as they fought over blanket forts and pillow forts, but there's so much else going on there that I'm hooked. I also thought that Britta pining after a guy named Subway was fun, and I'm also in favor of the Jeff and Annie tension to be addressed. What Didn't Work: If I had to pick something that I didn't care for, it'd have to be Pierce drinking ink. It was just one of those jokes that wasn't funny to me, so the fact that it became a running joke was a bit of drag. Luckily, everything else he did was relatively on point. 30 Rock: "The Shower Principle"
What Worked: I loved the fact that 30 Rock poked fun at itself by pointing out how nothing really changes on the set of TGS. It's this kind of meta commentary that makes this show special, and I'm always a fan of shows mocking themselves. Adding a decent Liz and Jack plot made things even better. What Didn't Work: I'm still not a fan of Hazel, and there was way too much of her this time around. This episode also had my least favorite versions of Jenna, Tracy and Kenneth, so there were too many grating aspects for me to get past. The Vampire Diaries: "The Murder of One"
What Worked: Any time Rebekah and Damon are paired up, I'm going to give the episode a pass because they're so good together. He just needs to ditch Elena once and for all because she turns him into a bore. I'm also going to give any episode that gives Caroline something to do some leeway as well. It's just too bad that she had to carry Alaric during this one. What Didn't Work: I'm still not loving this whole "Alaric had split personalities because of a ring" arc, but I have a feeling that his days are numbered. As always, I could have cared less about Bonnie, and I still cannot remember why Stefan's fighting with Klaus. The Originals need to go (except for Rebekah of course) soon. 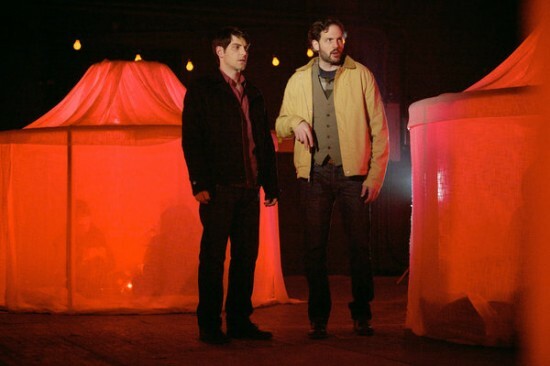 What Worked: Some of the flashbacks involving Nikita and Amanda were interesting, but Percy once again stole the show as he finally got Division back. Seriously, I could watch a show just about him, and I'm hoping that his return to power will make this show interesting again because Amanda as the boss was kind of a bust. What Didn't Work: Speaking of Amanda, I still don't care about her fling with the Gogol guy, but at least it made sense once Percy took back control of Division. Also, I still cannot buy into Alex's arc this season, so seeing her parade around as Alexandra Udinov just annoys me. What Worked: I'm all in favor of the world of Grimm being expanded, so I liked the fact that we got to see some of the dingier side of the fairy tale world even though the case-of-the-week was pretty straightforward. Introducing Rosalee was a smart move too, and I hope we get to see her and Monroe a little more down the line. It was nice having Adalind back as well. 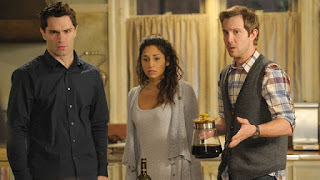 What Didn't Work: This week's monsters weren't very captivating, but they were just a reason for us to meet Rosalee, so I guess I cannot complain too much. There was also a moment there when I wanted to see Nick and Rosalee have a little spark because Juliette's role has run its course, and we need a new love interest to liven things up. In the end, I'm OK with her getting closed to Monroe just as long as she doesn't get in between him and Nick since they're the primary couple of the show. Spartacus: Vengeance: "Wrath of the Gods"
What Worked: Pretty much everything. The season 2 finale had its fair share of action, betrayal, intrigue, twists, turns and death. It was pretty much one of the best season finales in a long time because it wrapped up this chapter of the story while keeping us excited for the next one. Sure, we lost some great characters, but overall their deaths made sense. What Didn't Work: While I understood why Ilithyia had to die, I was sad to see her go because she's by far one of my favorite characters, and I wanted to see her live on, but the way she went out almost made up for the fact that she had to die. The one death that didn't make sense to me was Mira's because it was too telegraphed at the beginning of the episode, and she still could have contributed to the show in a meaningful way. I swear Sparty's junk's cursed.